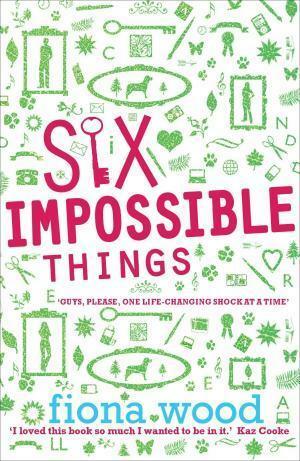 Just when I thought the Aussie YA scene couldn't get any hotter right now... along comes Fiona Wood's Six Impossible Things. There is so much to love about this book it's hard to know where to begin. Dan is completely lovable, funny and cute in such an unassuming way. His narration of the many tragic events unfolding in his life is teen angst with the most grin-worthy one-liners. He is sweet and hopeful and crushing hard on the unattainable girl next door (Estelle). And the Girl Next Door is ever so funky and cool and smart in that way that you just want to hang out with her in the hope that some of her coolness rubs off. The cast in this book were all fleshed out in such an achingly real way. Not only did I fall in love with Dan but I related to his Mum and I love how underneath all the charm and fun in this book, there's a lot of stuff readers can relate to: parent's separating/divorce, financial difficulty, depression, parent's mid-life crisis, wanting to be cool and accepted, getting your first job, wanting to get the unattainable girl and striving to be a better person but always seeming to fall short. I have to mention: I loved how Dan's attic was connected to Estelle's which led to some sneaky creeping around between the houses. Such an awesome set up. 1. It's funny. Brilliant one-liners, dialogue that just kills you with it's goodness, and the situations Dan finds himself in will have you grinning. 2. Dan - one of the best male POV's. Charming and smart and oh-so-funny and he transforms so awesomely from a slightly awkward geek to a cool confident guy. 4. The adult cast - completely shone, even those in minor roles. I wish every YA book would strive to put in adult charatcers who are so multi-dimensional and relatable. I also love the plot lines and story arcs for the minor characters. 5. The little quirky details and how it all comes together in a climax that made my heart swell with happiness. Also you never quite know just how the story is going to end. 6. It's one of the best books I've read - right up there with Graffiti Moon and Raw Blue and Beatle Meets Destiny and Jaclyn Moriarty's work. And: I read in an interview that Dan Cereill is an anagram of Cinderella. I know, very cool! I also think it's cool that they can sneak around in a shared attic. And that Cinderella anagram is awesome. Absolutely brilliant review! I am ordering this right now. The book sounds awesome! Thanks for the review! Unfortunately its not available in my country but I think I am going to order it online. Great review, I really like the sound of this book. The attics being linked reminds me of CS Lewis: The Magician's Nephew, and I always loved that idea. I will look out for this book.